This ship began her life as Matilde Wattenbach built by Frederick C Clarke in St Heliers, Jersey in 1853. Her principal owners were J J Melhuish of Liverpool and T H A Wattenbach, of London. 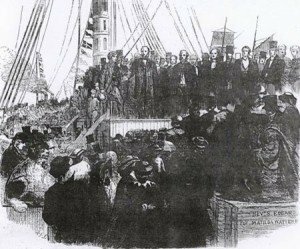 In one of her last voyages as Matilde Wattenbach, she left London in June 1862 with 800 non-conformists bound for New Zealand. The London Docks were thronged at an early hour on Thursday week by an immense concourse of persons assembled to witness the departure of the first instalment, about eight hundred persons, chiefly members of different Nonconformist bodies, who are emigrating to the new colony of Albertland, in New Zealand. Availing themselves of the liberal offer of the New Zealand Government to grant forty acres of land to every emigrant paying his passage to the colony [Illustrated London News June 7 1862]. In 1863, after trading for some years out of London to the Cape of Good Hope and to New Zealand, she was acquired by Philip Blyth, of London and the following year she was sold. 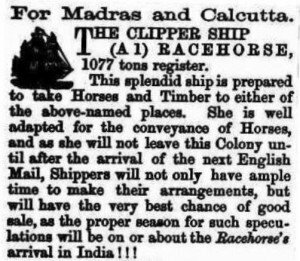 Within a few days she was purchased by Alexander Fotheringham and renamed Racehorse. The “foreign” sale and the resale, within a few days, to the Englishman Alexander Fotheringham were just to change the vessel’s name. 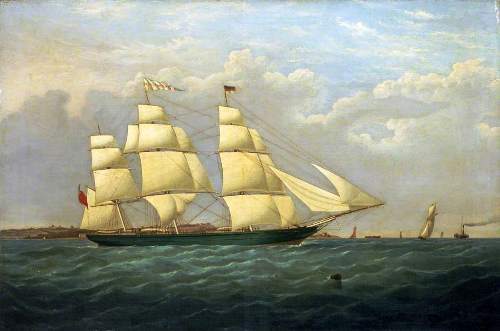 Between 1786 and 1871, British vessels were forbidden by law to change names. This was to help combat smuggling. A shipowner could evade this law by selling the vessel to a foreigner then buy it back a few days later. Upon its sale to the foreigner, the vessel was considered no longer British, so a British subject who purchased it even a few days later could rename it anything he wished. Racehorse was surveyed at Sunderland shipyards in January 1864 and at that time her specifications were 1077 tons, length 209.3 ft., breadth 36.1 ft. and depth 20.0 ft. For her voyage to the Swan River Colony another owner would be on the scene – John Smurthwaite, a Sunderland merchant. 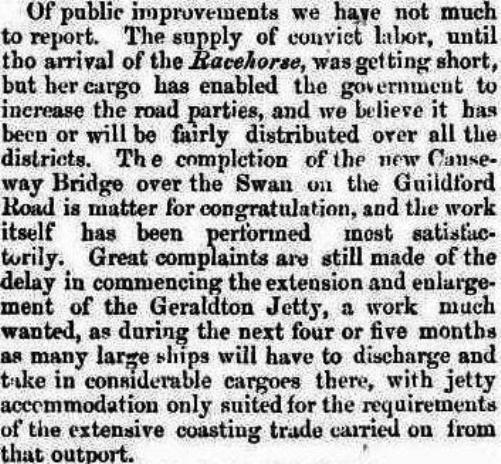 Racehorse left Portland on May 26, 1865 bound for Fremantle. She carried the 32nd of 37 shipments of male convicts destined for Western Australia. 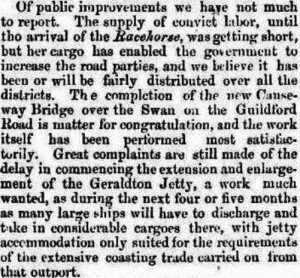 The voyage took 76 days and the Racehorse arrived in Fremantle on August 10, 1865 with 172 passengers and 278 convicts. M H Seward (DPS) or J Mann (Lloyds Register) and Dr Alexander Watson were the captain(s) and surgeon respectively. Three deaths were recorded on the convict shipping and description lists – one disembarked in Portland, one died on the voyage out and the third in hospital soon after arrival. There were 280 convict numbers assigned for the voyage ranging from 8191 to 8470. Thus 280 convicts embarked and 278 arrived. Of the 172 passengers mentioned above, 159 were pensioner guards and their families, the number being made up of 50 pensioner guards, 31 wives, 38 sons and 40 daughters. There were also five warders, their wives and children on board, the Head Warder being Henry Passmore. Rev. William Irwin, Religious Instructor was also aboard. Seventeen of the non-convict passengers were veterans of the Crimean War. Horses for Courses – the Racehorse a horse transport? Clipper Ships and Naval War History Website. Painting of Matilde Wattenbach, later Racehorse, courtesy of National Maritime Museum, Greenwich. Newspaper clippings from TROVE, National Library of Australia: Perth Gazette & West Australian Times 25 Aug 1865.